From now, I can tell Chrome to use Gmail as my email application and any link with an email address will be opened as a compose window in Gmail. Click ‘Use Gmail” button and try the below link to see what happens. If threading of the email is the only thing that stopped you to use Gmail, now you can turn off the conversations, and see the emails like in Yahoo mail or Outlook. You will be seeing this option (to turn off Conversation view) in the Settings page soon. Have a suggestion for Gmail? Gmail’s Priority inbox brings your important emails to the tops and make it much visible for you. 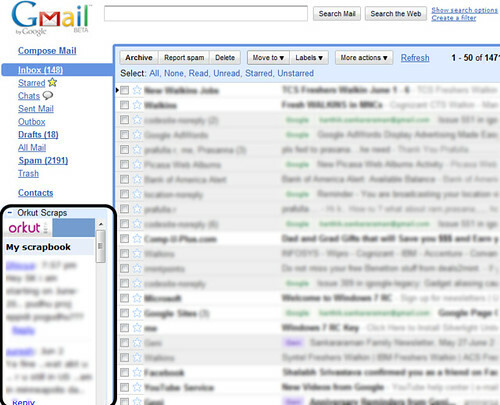 Gmail automatically tracks the actions you do with your g(e)mails, and identifies the important email messages for you. 1. If you are frequently sending email to Bob, then an email from Bob is important for you. 3. The contacts whom you often reply, or whose emails you often “star” are important for you. 5. If you don’t do any of the above, you can use the “Important” and “Not Important” buttons in Gmail, to train Gmail to identify the priority emails for you. If you are a pro, you can define a filter that tells Gmail, what is important for you. In order to use Google Latitude from Gmail, you should have enabled Gadgets in Gmail. Once you have done that, go to the Gadgets tab in Gmail settings. Give the gadget’s url as http://www.google.com/ig/modules/fv.xml and add. Now you are set to use Latitude from Gmail. The Latitude gadget appears on the left navigation bar of the Gmail page. When you click on your photo in the gadget, it gets launched in its canvas view (full screen). 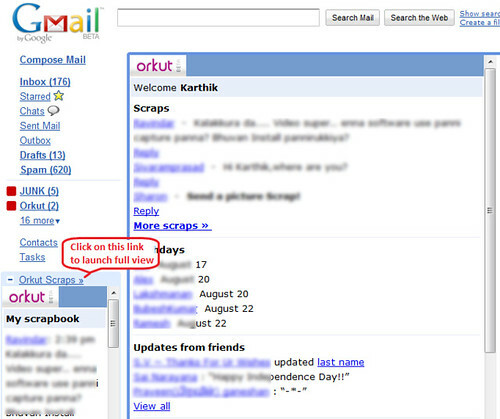 This is an update to my previous post on “View your Orkut Scraps in GMail”, the gadget is updated to have the Canvas view. Now you can click on the gadget title link to launch it in full screen, canvas view. Please read my previous post for How to add this gadget to your GMail page. In one of the previous posts , we saw about how to add iGoogle gadgets to GMail.These GMail gadgets need not be only in the small sidebar, which of less than 200 pixels width. Since iGoogle now supports gadgets with Canvas view, GMail gadgets can also be with canvas view (full view). We will see how to develop a simple GMail app, with Canvas view enabled.If you can code html, check the simplest form of a Google gadget below. 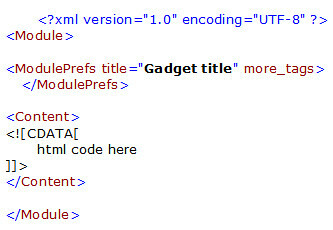 After coding the complete gadget as above, upload the xml file somewhere. Now, you have the xml file uploaded somewhere, and its url ready. How to add the gadget application to GMail? 1. In Labs tab, under Gmail Settings, Enable “Add any gadget by URL” feature, Save changes. 2. Now Go to the Gadgets tab in Gmail settings. GMail – out of Beta ! Do you still want beta label? Many of you might have noticed that Google has removed the Beta label from GMail today. Didn’t notice yet? check your GMail ! In addition to GMail, Google Calendar also is out of beta version. Not happy with GMail without beta label ? Do you still think GMail should be called beta ? Google provides an option for that ! Enable “Back to Beta” ! Save the changes, and You are all set with the Beta label again. 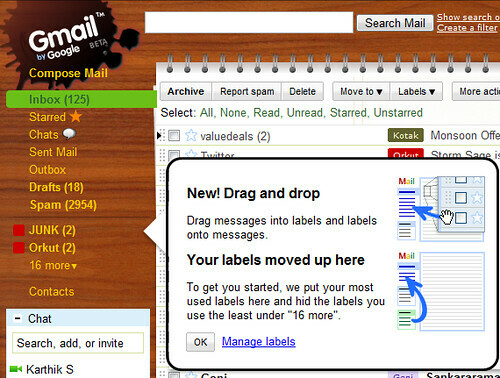 Since GMail uses Labels, instead of Folders, which many users were not used to, Labels were not used much initially. 1. 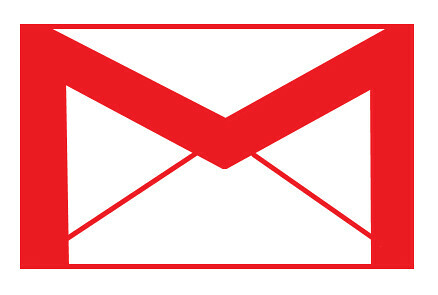 You need not hide the email message from inbox, if you want to categorize a email message. 2. Adding multiple categories to a single email message was never possible. Even though Labels have these advantages, users liked the traditional Folders in email. For attracting users, Google added a button to GMail, called “Move to”, which simultaneously applies label, as well as archives the message. This gave a feel like moving to Folders, but still having the pros of Labels. Until few days back, a list of labels were appearing below chat box. Now, these links for Labels have moved above Chat Box, and you also can Drag and Drop emails into Labels. This hopefully will attract more users to use labels.